Filipnio boxer Renz Rosia to challenge the current IBO world flyweight champion Moruti Mthalane. The fight will be held in South Africa on December 12, 2015. 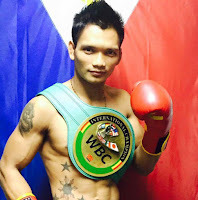 Rosia is a 27 year old boxer from Cadiz City, Negros Occidental, Philippines. He is the current WBC International flyweight champion after beating the fellow Filipino fighter Renan Trongco via 10th round TKO. Doctors stop the fight at the 10th round after seeing the cut of Tronco which is cause by a punch. Rosia will fight in South Africa for the 2nd time. Rosia fought Makazole Tete for the vacant International Boxing Organization Inter-Continental flyweight title but lost by points. Rosia currently has a record of 12 wins including 6 wins by way of KO and has only 3 defeats. On the other hand, Moruti Mthalane is a South African fighter. He is a former WBC international Flyweight champion, IBF world flyweight champion and the current International Boxing Organization World flyweight champion. Mthalane defeated a very known fighter like Johnriel Casimero, Julio Cesar Miranda, Zolani Tete and Ricardo Nunez. Also fought Donaire but loses the fight via TKO. The South African fighter handled a record of 31 wins including 20 wins by KO and has only 2 defeats.